Yesterday, I had two very smart comments from Janet and Bella about what I'd written on the customer always being right heard. Janet wants to see the second chapter in the short story of Mrs. Jones' complaint about being overbilled. Three hours of service from ABC Plumbing? Pshaw, says she. Mrs. Jones insists that it was two. Strike an hour from the bill because "the customer is always right"
Janet also wonders: how does a company "stand behind its employee, and satisfy the customer?" Bella, likewise, asserts "whether you like it or not, there will always be a certain amount of giveaway and subservience. That's why it's called customer service." I love that... customer service, indeed. So how does a business rectify the situation? Assuming that there is no way to prove either story - two hours or three hours - the business has a decision to make. I think we've all done business with a company that didn't listen to us at all. We call to air our concern and we wander in a maze of phone menu, or we speak to someone with all the personal skills of cardboard, or we're simply told we're wrong and that's the end of it. Do we feel heard? In any contention in any relationship, our first best step is to simply listen fully to what the other person has to say. As Stephen Covey says, we should "seek to understand before we seek to be understood." That alone says that we esteem the other person and their point of view. If we stop them from speaking what they need to air, we only compound their frustration. And so as difficult as this may be, we need to be quiet and put ourselves aside for a moment and just listen. Bella says it well when she says that "most people in situations like this want what is right, not just to be right." The emotion of it wants to be right. By listening fully and silently, we help subside the emotion of it. And in that relative calm, most people are ready to want what is right. Sanity lies in having the right relationships in our lives. That applies personally as well as professionally. No business should have a relationship with someone who doesn't want a fair trade. Giving away the store for the sake of maintaining a customer is not good business. While a business owner might feel good about the company wearing a steak around its neck to attract the hounds of the world, it's not worth it. Some customers are not worth the expense. So to answer Janet's great question: it depends on the value of Mrs. Jones as a customer. If Mrs. Jones always undercuts the word of employees, then it's best to part ways. Mrs. Jones can go be right with some other company. Severing the relationship is best. But if this is a hiccup in an otherwise sound relationship, and if Mrs. Jones persists in her story, then seeing it her way this one time is well worth it. She liked you before, she had a complaint but found that you listened to her, and she saw that you valued her business enough to see it her way this one time. Her repeat business and now positive experience increases the word-of-mouth marketing that she'll do for your company. The smart move is to let her be right. We only show integrity when it costs us something, and integrity is an adjective every company craves about itself in the mouths of its customers. The "customer is always right" - a business cliché - has the right heart, but the wrong direction. It's not that the customer is always right. Sometimes, the customer is wrong. Everyone knows that. By saying the "customer is always right," it's an effort to try and satisfy the customer. Satisfied customers come back, you see. Therein lies the logic. Any business transaction should satisfy the customer - obviously - but it should also satisfy the company. No company stays in business that tries to satisfy everyone by giving away the store. The right direction is that customers should always be heard. Whether a customer is right or wrong, what matters is that they matter. Customers feel significant and respected when they feel that a company has listened to them. "Hello... ABC Plumbing? This is Mrs. Jones." "Hi Mrs. Jones. What can I do for you?" ABC Plumbing could simply give in to Mrs. Jones and take off the amount perceived as overcharged. After all, the "customer is always right" - right? There's a better way to move ahead with this. "We overcharged you? I'd like to know more about that. Do you have your statement handy? I'd like to walk through it with you." "Yes, I have it right here." "Tell me the part that you feel is incorrect, if you would." "It says here that your man worked for 3 hours. That's not true. He was only here for 2 hours." "I see on my system here that Jason did the work for you that day. I'd like to call him and ask him about this. What's a convenient time to call you back?" "I'll be home this afternoon." "I appreciate that you brought this to my attention, Mrs. Jones. Let's get to the truth about this." "I'll call you back at 2:00. Thank you for contacting us about it." "Yes. I look forward to getting this corrected." At this point, whether the time charged her is correct or not, Mrs. Jones has been made a partner with the company in solving her problem. Getting to the truth - whether accurate or not - is now the mission. She knows that the company has completely heard her side of it. She feels valued and important. And if the bill was accurate and she's wrong, Mrs. Jones is more apt to agree to the truth. Taking the time to listen and then taking action on their behalf cements customer loyalty, not give-aways and subservience. The business owner's chief responsibility to employees and customers is to sustain the business. Listening is the best path for continued success. I think businesses can succeed when they have that as their mission statement, and the Wii has certainly done that. In interacting with you, do you help people feel something unprecedented? When customers shout their needs at a company, it's the company's job to listen and listen well. Otherwise, it might not remain in business. Listening is Job One. Managers listen through daily reports of the business. They listen to employees, who are usually the "ears" of the company. Managers listen to market trends exhibited by competitors and in collateral industries. It's a tough job, listening. But when you do listen well, how do you show that you're listening? In person, you do it with eye contact. By responding along with the flow of the conversation and with little cues - verbally and nonverbally - you show you're engaged. A corporation, per se, can't make eye contact. Each employee can make eye contact and give the customer rapt attention. That's a good start - to build an interpersonal culture where business meets the street. But people often feel that though they give their comments and concerns to the nearest attentive employee, the message goes no further. The attention is shallow. No matter how large the company, people crave personal response - all business is personal. Especially now, when competitors are not just local but regional and global. How cool it is when someone suggests something to a company and, a week later, it's implemented. The customer sees response in action. They see change. When customers see the impact of their bid, they respond with devotion to the brand. Show that you listen, and customers will show you continued business. 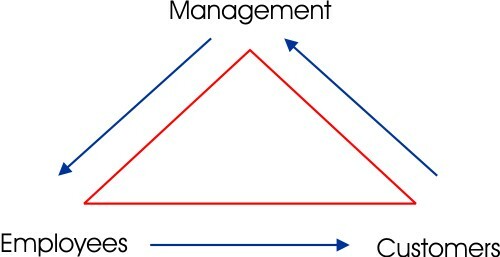 Business is a triangle of management, employees, and customers. Management provides tools and materials to employees. Employees serve customers' needs and requests. Customers give something to management. And no, it's not just dollars. Customers give their desires and opinions to management. Or at least they want to. Customers cry out for management's attention. Customers want management to listen. The thing is that management doesn't always do a good job of listening, and generally, when they are listening, they do a poor job of showing it. The companies most loved are those that listen to customers and then show that they listen. Customers reward management with loyalty. Listening is the first and most important job in any company. "We believe that most of the matter in the universe is dark, i.e. cannot be detected from the light which it emits (or fails to emit). This is 'stuff' which cannot be seen directly." And yet, dark matter might be having a big impact on the universe due to its gravitational effect, just as we detected an unseen Neptune long ago by its pull on Uranus. 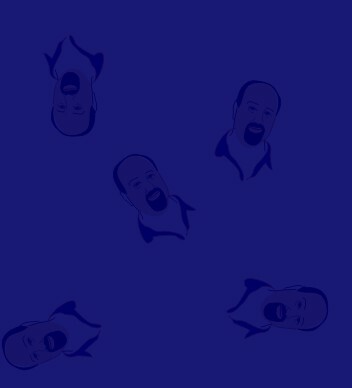 In business, there is also dark matter. The dark matter of business are those transactions that take place in your industry without your awareness of them. It's the stuff you don't see, and that you don't know you're missing. What disruptive innovations will take place to radically change your business? What competitor will come along and challenge your bottom line? What customers are you missing? Who's the 800-pound gorilla in retail today? Wal-Mart, right? The mom and pop stores never saw that coming when Wal-Mart first came onto the scene and challenged local businesses. But look at Wal-Mart again... the online world hasn't rubbed out Wal-Mart like Wal-Mart rubbed out the mom and pop stores, but it's funny how Amazon sells mom and pop items and how eBay has its plethora of stores from mom and pop operations. Some people buy from eBay and Amazon far more than they ever set foot in a Wal-Mart. Does this concern Wal-Mart? Do you think this impacts Wal-Mart? Did you know that eBay gets twice the visitors to its online site than Wal-Mart does? 51 million for eBay in a month versus Wal-Mart, which had 24 million. Amazon also handily beat Wal-Mart, as Amazon had 43 million visitors in a month. The youngsters whooped up on the gorilla. Wal-Mart has dark matter - business that happens without Wal-Mart's awareness. It bugs 'em. And it should. They're working hard to catch up. Just as dark matter should bug you where you work. Whether you're the owner, a manager, or an employer. You can't miss what you don't know, and the attractive tug of what some unseen competitor is doing might affect the traffic to your store. Where's the dark matter for your business? How can you tap into it?